I know any conversation relating to the loss of a pet is a tough one to have, and talking about pet urns doesn’t make it any easier. I will never forget the first time I had to say goodbye to a pet. Her name was Calypso, and she was 3 weeks old when I found her in a pile of garbage on my way home from work. I had her until her kidneys failed at the age of 17. When the vet came in after taking tests, and told me there was nothing to be done, I went hysterical. Seeing that piece of paper you have to sign, giving them permission to end your beloved pet’s life is almost unbearable. I was overwhelmed when asked what I wanted to do (cremation, did I want the ashes back…), my head was spinning. I had never been faced with anything like this and I was totally unprepared. Of course I knew I would want her back with me, and then I was given a sheet with pictures of urns. I had no clue what I was looking at, how much anything costs (it’s surreal talking money), or what to choose. I pointed to something and that was that. It turned out to be a lovely cherry wood coloured wicker box, and it was nice enough to sit on my bedroom dresser. When I looked around at what was available (years later when I wasn’t in the depths of despair), I couldn’t get over how many styles and design options there were. How in the world do you choose? Will you keep them with you? If you’re having your pet cremated with the intention of burying or scattering ashes, there doesn’t seem to be much point in spending a lot of money. It’s up to you, obviously, but I wouldn’t. There is something called a “scatter canister” (I don’t know if that’s the universal term for it) which are round tube shaped sturdy containers that you can use to scatter the ashes when you’re ready, or keep them forever. The ones I have are of a forest scene and they are quite nice. I used to keep them on the bottom shelf of my tv stand, so they weren’t “in your face” or obvious to visitors what they were, but I could always see them so I felt like they were included. If you’ll be holding on to the ashes, and you want them displayed in a prominent place, I’m guessing you’ll want the container to blend in with the room it will be kept in. Our tastes differ, but there is bound to be an urn you’ll love, that will look good wherever you’re intending to keep it. I will obviously be highlighting urns for dogs, but all (except for one I believe) are also suited for cats. I will, however, feature a couple of cat-specific urns. I find this fascinating, and certainly the first time I’ve ever seen or heard of such a thing. 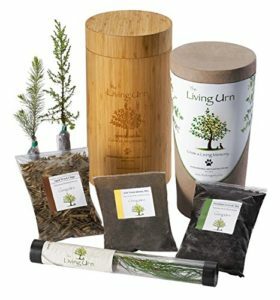 It is a biodegradable urn and planting system, that transforms the cremated remains of your beloved pet into a beautiful enduring tree, plant or flowers. You get the biodegradable urn and planting system, then you go to your local garden centre and choose the tree seedling, plant or flowers you’d like. Simply follow the instructions, and then watch the beautiful living memory grow from your pet’s cremated remains. Lovely! 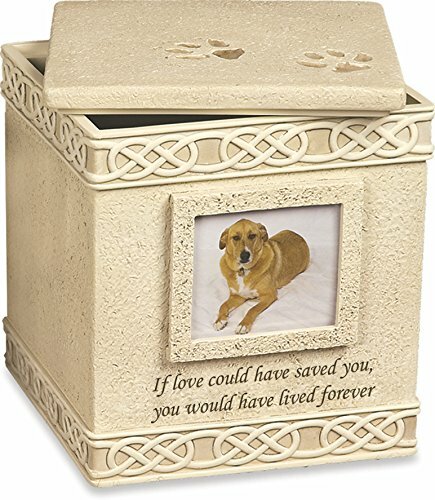 I think this cream coloured urn is gorgeous, with the touching words on the front, and paw prints on the top. 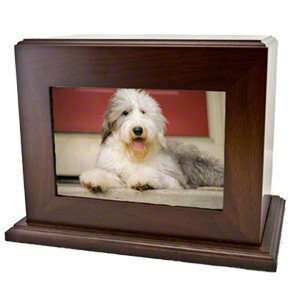 It measures 5” high, with a 2”x3” area for a photograph of your pet. It has a very versatile design, and would fit in to most decors. I love this because it’s more than just an urn. 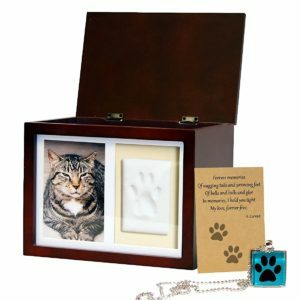 You can display a photograph of your pet, and also make a paw impression that can be added to the outside of the memorial box, next to the picture. Everything you need to make the clay print is included, as well as a lovely poem and teal coloured paw print necklace. Your pet’s collar or ID tag can be added as a keepsake. When I saw this I couldn’t help but think I Dream of Jeannie and Arabia, and personally I think it’s stunning. Beautifully etched and constructed of solid brass, it’s perfect for dogs, cats and other pets. Available in 5 colours and 3 sizes to accommodate pets up to 70lbs. 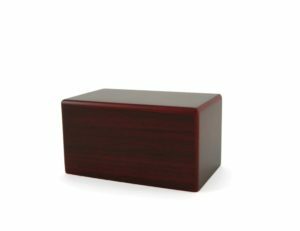 If you’re looking for something simple yet stunning, with a purpose that isn’t “obvious,” then have a closer look at this memorial box. Available in cherry or natural, it is made of medium density fibre board, and has a bottom sliding panel. It is perfect for pets to 15lbs. This beautiful brass urn is solid and heavy, with a lid that screws on easily. The pad at the bottom is a nice touch, protecting any surface from scratches. The edge of the lid can be engraved, as a tribute to your beloved companion. What I like about this is how unobtrusive it is sitting on a shelf. Nothing “in your face” about it. Suitable for pets up to 70lbs, it comes in 3 sizes and 5 different colours. If you love the look of wood, then this is for you. Simple but beautiful, it is available in oak or walnut, and horizontal or vertical styles. Being able to display a photo is important to many, which is another wonderful feature of this urn. The acrylic window slides out of the bottom so it’s easy to add a favourite photograph. I like the fact that it isn’t obvious that it’s an urn. Available in sizes medium and large, they can hold pets up to 120lbs. 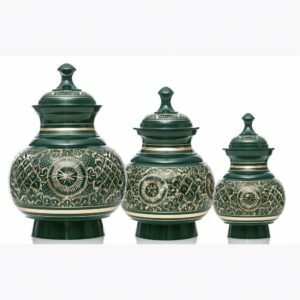 Urns don’t only have to go inside the home do they? 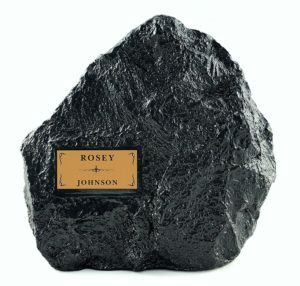 This granite garden rock, made of stone particles mixed with poly-resin, will protect your pet’s ashes while outside. If you spend more time outdoors than in, how beautiful to sit outside in the garden, and know your beloved pet is with you. It has an attached name plaque, with 2 lines of engraving and 20 characters per line included in the price. This urn holds pets up to 100lbs. 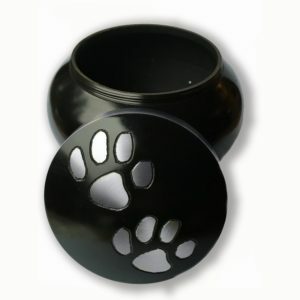 This onyx pet urn is stunning! 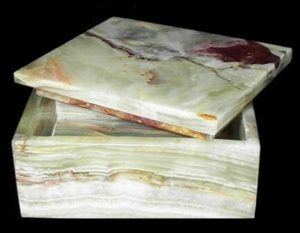 Handcrafted, each urn blends natural banded Onyx shades of green, brown, honey and burgundy tones. These gemstone Onyx pet urns are richly polished, with the lid expertly handcrafted to allow the option to seal. While all (except one) of the above highlighted urns are suitable for cats, you may prefer something cat specific. I would. 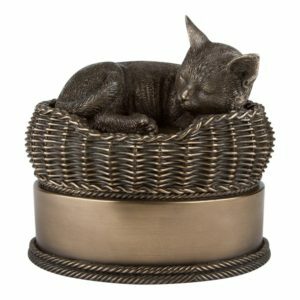 This hand painted cat in a basket in is crafted from cold cast resin, and I think there’s something very peaceful about this design. The urn opens by a bottom panel covered in felt to protect the surface of your furniture. 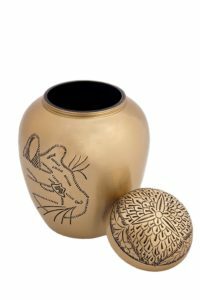 I love the Egyptian feel of this 100% brass, hand engraved and painted cat urn. It closes securely with a threaded lid and has a felt-lined base to protect surfaces from scratches. Appropriate for a cat weighing up to 25lbs. This really is a depressing topic, I know, but when we invite a pet into our home, we know this is part of the deal. Sad, but true nevertheless. I like to have my pets’ ashes with me, it makes me feel like they’re still part of the family. Whether you choose to display your pets’ ashes in a prominent place or not, with the selection of pet urns available, I’m sure you’ll find something that will honour the memory of your pet and keep him or her resting comfortably. The options that are available today are a far cry of what we once had to choose from. He options are endless. Being prepared is key but similarly, nothing can truly prepare you for when they leave us. Hi Lindsay, I know what you mean – how do you choose! Instead of not talking about those who have left us (as happens in many families), I think your stepfather’s tradition is a beautiful one. It’s such a difficult subject to talk about, but we should all be prepared. These are all wonderful ootions but I think I like the living tree the best. I’ll tell you what, it was hard for me to write it, and the other pet loss related posts. It just brings back the memories doesn’t it. I love the living tree, it’s such a beautiful tribute, forever a part of mother nature. 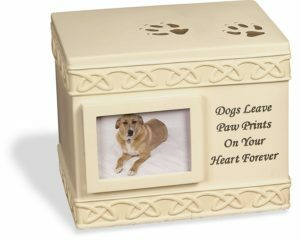 I liked it when you said that in case a pet owner wants to keep their pets in a prominent place, there is always a pet urn that will match the room. I wonder what kind of urn that is because I really do want to keep my best friend very close to me. Perhaps, I will get in touch with a professional and hear what they have to suggest when it comes to an urn. Thank you for sharing. 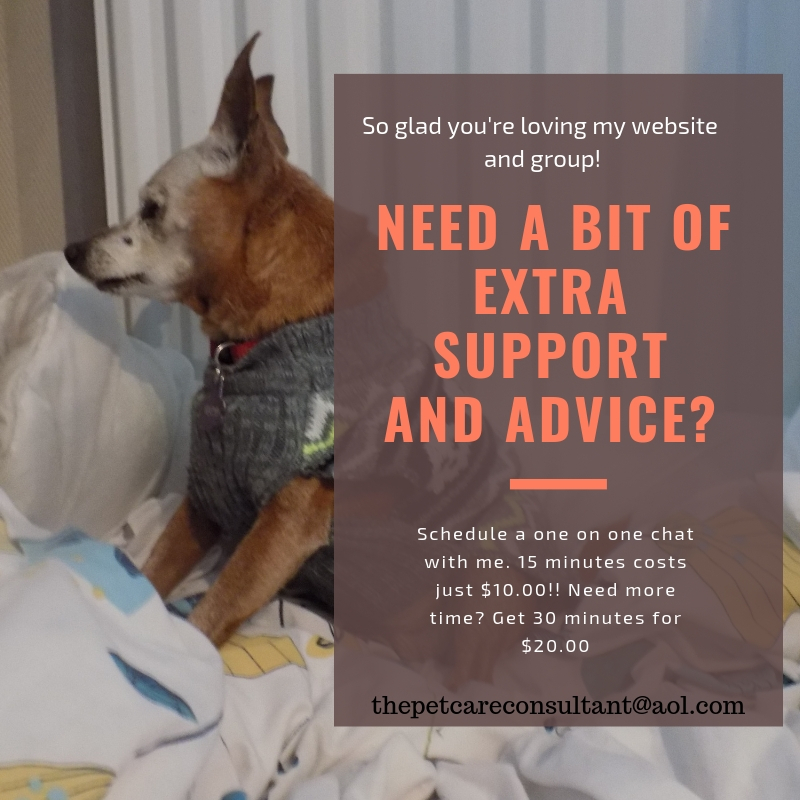 I know from experience how comforting keeping our pets close to use can be. With an almost limitless number of urn styles, designs and colours, keeping them close is even easier.